Though our system runs various checks on the device parameters and several other properties to stop users from earning rewards through some fraud mechanism but there is still a chance that they may pass these checks as it is very easy in Android to root a device and change its parameters, they may even try to earn reward by installing app on some emulator devices where device parameters won’t be of much help. To avoid such cases we have included Emulator/Root checks inside our SDK, which in turn are a combination of several checks we have developed to know if a device is an emulator or if it has been rooted. Once these checks are enabled the system will not reward any such users who have installed the app on en emulator or a rooted device. By default these checks are disabled and would run only if you enable them. To do so you would have to enable them on dashboard as well as configure the same for the AppVirality SDK inside your app. The below section explains the same. 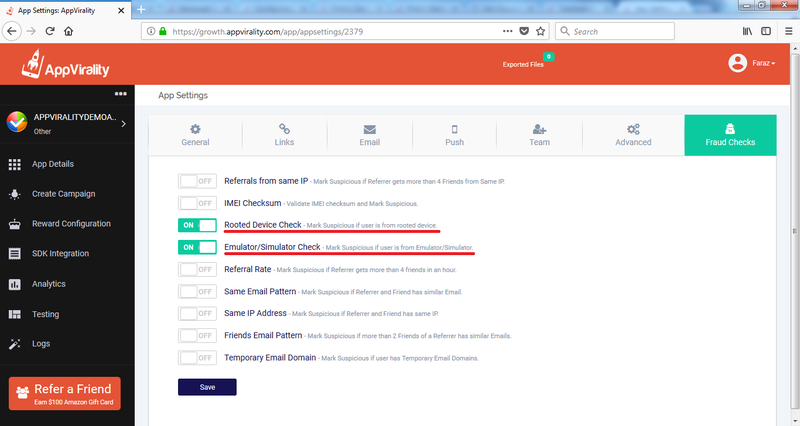 To enable these checks on dashboard just navigate to the Fraud Checks page and turn ON the switch against the check(s) which you want to be enabled for your app. Don’t forget to save the changes you make. Only enabling the check from dashboard will not work, SDK also needs to know whether it has to run those checks or not. To do so you need to set it in the Config class instance and pass it over to the SDK while instantiating the AppVirality class. Please refer the below code block for enabling Emulator/Root device checks on SDK.